Call centre staff turnover is notoriously high, but our panel of experts is on hand with tips on how to improve staff retention. Staff engagement can be driven by an open and transparent business. This leaves both parties in more beneficial positions. We’ve found that by offering forums, suggestion schemes and business scorecards, employees of all levels are able to air their views and concerns. This creates a workplace where people feel valued and where they don’t believe their views are not heard. By taking on board this input, not only will a contact centre be able to maximise customer satisfaction levels, but staff will feel involved in business decisions and motivated in their roles. Better employee engagement results in better job satisfaction, helping to reduce the desire to move companies. There are very few people, across all levels of a business, that haven’t had the need to speak to someone, who might not necessarily be the person they report to, about their job or company. It happens every day, in every job across the world. A line manager can help to ensure that the advice, best practice and an open culture is implemented by educating staff on all aspects of a business. With the ability to play a strategy down to an appropriate level, it is their responsibility to indicate to staff what role they play in the overarching business plan. This is not to say that managers must reveal all and uncover the nuts and bolts of the organisation, but actually, it is good business practice to identify the right level to pitch at and provide the right balance of information to ensure maximum understanding across the board. If introduced appropriately, a line management system should drive an individual’s performance and behaviour by linking it to the wider plan and business drivers. A relatively obvious tip, but one that nonetheless shouldn’t be ignored. Once employees are aware of the role they play in individual areas of the organisation, and how this fits in to the bigger business picture, it is easier to assign financial rewards. One way, of course, is through an employee’s salary. If it is reward-related and reviewed through an annual appraisal scheme, a business can identify a particular employee who contributes to the overall business plan and its objectives. Incentivised pay schemes help encourage employees to achieve goals. Morale increases as staff will be more satisfied in a role that offers a challenge and delivers a result. It’s hard to get away from the fact that the daily work of call-handlers can become repetitive. Moving staff around departments every so often, if they fancy a change, is a good way to deal with this. Pay isn’t always a very important thing. When recruiting people, pay is important, but in order to retain people, especially the younger generation in call centres, which is usually twenty-somethings, the added benefits that you give are also important. I don’t mean the pension, because a 23-year-old isn’t always thinking about when they want to retire. We have benefits like half-price tickets to Cardiff City and Swansea City matches, deals with our clients to offer staff discounts on mobile phones and Sky television, which obviously appeal to the demographic we’ve got, as mobile phones are quite a ‘cool’ product. We have a childcare voucher scheme where you can save around £80 a month on childcare by sacrificing from your salary. So it’s important to have a benefits package alongside your normal performance-related pay. This generates a value greater than some of the bonuses staff expect. Being a call centre we need our staff to be flexible, as we set our schedules in line with our clients’ needs. We have a shift-swap policy in which if the shifts an agent is given aren’t suitable, they can find someone else in the department to swap with. In a department with 300 people that means there’s a good chance someone will be willing and able to swap. We also have a flexible working policy in place because that’s something that employees seem to value as much as anything these days. Another important aspect is that we have a policy of promoting internally. It works well for the business in terms of cost, and also the experience of a person that’s been on the phones at the company makes them a good candidate for development within the management structure of the company, because they’ve got the best knowledge. It’s also a motivational factor because people can see that once they get into a call centre they can progress very quickly into a team leader role. From there they can often keep moving up, or branching out into one of the support functions like recruitment or training. In the current economic climate, it is easy to hear a request from staff for further training as nothing more than an additional cost. However, in my view it is something that should be accommodated if at all possible, because it demonstrates the individual’s commitment to the business and the fact that they share your vision and purpose. As part of our commitment to our staff and the local community we support a number of employees both financially and practically to undertake academic and vocational training and secure qualifications. 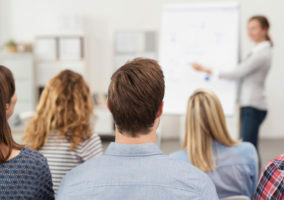 By supporting staff education and training you are encouraging self-development, opening up opportunities for promotion and self-betterment and increasing the skills set of the business – and that can only be beneficial. The key to keeping staff happy and motivated is actually in fostering external experiences, so the whole company pretty much descends on a local bar every Friday. Also, if someone is acting in a show or play we’ll try to go out and watch them in their performances. Call centres can be very social environments and can benefit from having a real sense of community. All our staff are working actors. We support our staff by allowing them time off to attend auditions at very short notice – just half an hour sometimes. Most call centres can’t operate like that. But there is still a kind of reciprocity that managers can create by being flexible in supporting something an employee wants to do, on condition that the employee is open to similar flexibility if, for example, the business needs shift cover further down the line. High staff turnover and attrition rates? Are you to blame? It is also very important to avoid high workload. Good agents will find some place else to work if they feel that they are working more than they should. It’s critical to have enough resources to cover the workload, and not have people doubling the necessary work, for instance. I’ve seen situations when agents could not even take their lunch breaks because of a high volume of calls. It’s definitely something to avoid and it eventually comes down to good resources management, according to the existing workload. Very detailed and tailor fit to understand and avoid attrition. Ensures win-win resolution for both external and internal customers. Allowing agents to swapping shifts you encorage the relation between agents and increase their team feeling. Although it’s important agents know that if they have a problem, they can talk with management team to fix their timetables if it’s required.